ST-type(L-type, MS-type) is mostly used on embroidery. 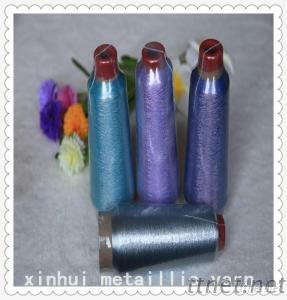 It is made by one M-type (unsupported) metallic yarn completely covering or semi-covering a core yarn. It is also referred to as ‘round metallic yarn’, because the core yarn is completely or semi-covered by an M-type metallic yarn giving JB-series metallic yarn a round, wire-like shape. It has a smooth, reflective look and strong tensile strength. Apart from embroidery it is also widely used on labels, ribbons, knitted fabrics, sweaters, ropes and etc. You are welcomed to contact us for more details.